On the far west side of the USD campus sits the Joan B. Kroc Institute for Peace and Justice. Behind the building is a reflection pool that bubbles with the soothing sound of flowing water. “My favorite place on campus,” comments Maya Hood ’17 (BA), a sixth-year women’s basketball player and graduate student. Atop a hillside, the garden offers a spectacular view of Mission Bay and the Pacific Ocean. It’s tranquil and serene. More than once, Hood has retreated to the spot to reflect on her life. “My thoughts are that I should write a book,” says Hood. She arrived at Alcalá Park in 2012 with her twin sister, Malina. As a first year, Maya averaged 10.3 points, was second on the team in scoring and was named the West Coast Conference’s Newcomer of the Year. Late that season, days before turning 20, she became pregnant. In June of that year, her older brother, Saron Hood, a former wide receiver at the University of Buffalo, collapsed while playing basketball and died. He was diagnosed with a thickening of heart walls that causes blockage of blood flow. Amidst the turmoil, for a nanosecond, Hood considered all her options. But she knew the right thing to do was to have her son. “The biggest thing, for me, is deep down I knew he deserved to have a life,” says Maya. Elijah Alexander Ayala turned 4 in November. With Alexander, he shares Saron’s middle name. In December 2016, Hood was enjoying what she thought would be her final season at USD. She was averaging 18.1 points, 8.1 rebounds and 2.8 steals, tops on the team in all three categories. But in the ninth game, she suffered a torn anterior cruciate ligament and meniscus tear to her right knee, ending her season. Hood was granted a sixth season of eligibility by the NCAA as a medical redshirt. Hood has a chance to set USD career records in scoring, rebounding and steals. She earned her undergraduate degree last May and is now pursuing a master’s degree in leadership studies. 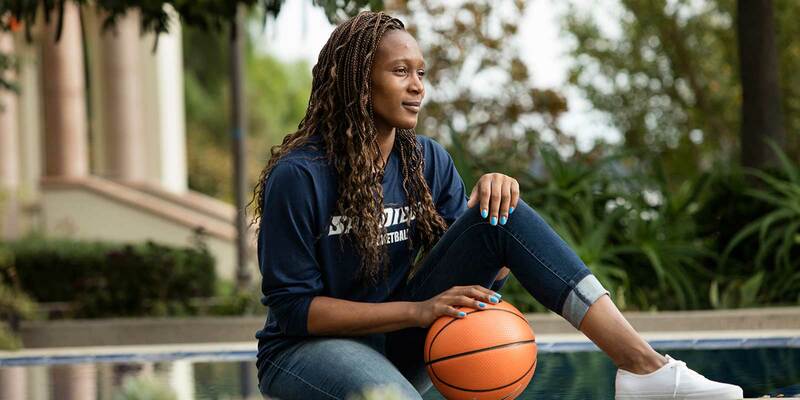 She plans on playing professional basketball in Europe when her career at USD is complete. Child care will be one of the provisions of her contract. You are non stoppable!!!! You are blessed and ready for the next steps in your life wherever they may take you. Congratulations!!! You are earning this opportunity. Awesome story Maya. Keep pressing on. You will get there so that you can inspire other young women.